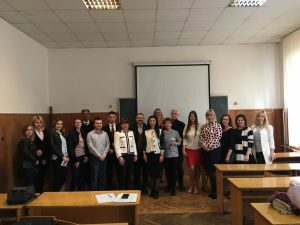 On April 12, 2019, the international scientific and practical conference “Protection of health rights of a person of the fourth generation” took place in Uzhhorod National University”. 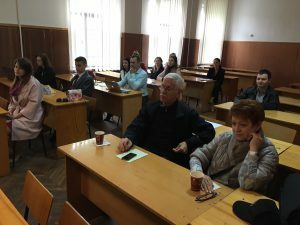 Event organizers were Uzhhorod National University, the Center for Ukrainian and European Scientific Cooperation, Research Institute of Comparative and International Law, Coordination Council of Young Lawyers of the Main Territorial Department of Justice in Transcarpathian Region. The international conference took place due to the laborious preparation of the Organising Committee which consists of Rohach O.Ia, Doctor of Law, Professor, Vice Rector for Academic Affairs of Uzhhorod National University, Lazur Ya.V., Doctor of Law, Professor, Dean of Law Faculty o Uzhhorod National University, Buletsa S.B., Doctor of Law., Professor, Head of the Department of Civil Law and Procedure of Uzhhorod National University, Barzó Tímea, Dr., PhD, Head of the Department of Civil Law, Associate Professor in the University of Miskolc, Bysaha Yu.M., Doctor of Law., Professor, Head of the Department of Constitutional Law and Comparative Jurisprudence of Uzhhorod National University, Bielov D.M., Doctor of Law., Professor, Professor at the Department of Constitutional Law and Comparative Jurisprudence of Uzhhorod National University, Bilash O.V., PhD in Law, Associate Professor, Deputy Dean of Law Faculty of Uzhhorod National University, Boldizhar S.O., PhD in Law, Senior Lecturer at the Department of Administrative, Financial and Information Law of Uzhhorod National University, Dynys H.H., PhD in Law, Professor, Head of the Department of International Law of Uzhhorod National University, Zaborovskyi V.V., Doctor of Law., Professor at the Department of Civil Law and Procedure of Uzhhorod National University, Karabin T.O., Doctor of Law, Head of the Department of Administrative, Financial and Information Law of Uzhhorod National University, Mendzhul M.V., PhD in Law, Associate Professor, Senior Lecturer at the Department of Civil Law and Procedure of Uzhhorod National University, Panina Yu.S., PhD in Law, Senior Lecturer at the Department of of Civil Law and Procedure of Uzhhorod National University, Savchyn M.V., Doctor of Law., Professor, Director of Research Institute of Comparative and International Law of Uzhhorod National University, Slyvka O.O., PhD in Law, Deputy Dean of Law Faculty of Uzhhorod National University, Sukhan I.S., PhD in Law, Senior Lecturer at the Department of Administrative, Financial and Information Law of Uzhhorod National University, Cherevko P.P., PhD in Law, Associate Professor, Deputy Dean of Law Faculty of Uzhhorod National University, Chepys O.I., PhD in Law, Associate Professor, Senior Lecturer at the Department of Civil Law and Procedure of Uzhhorod National University, Fridmanskyi R.M., PhD in Law, Associate Professor, Deputy Dean of Law Faculty of Uzhhorod National University. Not only legal scholars but also practitioners (doctors, judges etc.) were among scientists who participated in discussing topical issues of implementation support and protection of human rights in the health care sphere. 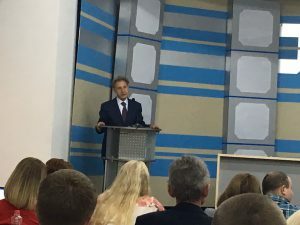 Prof. Bielov Dmytro and PhD Hromovchuk Myroslava spoke at the conference on behalf of the Center for Ukrainian and European Scientific Cooperation. 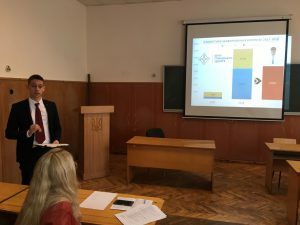 Among the participants were: Buletsa S.B., Doctor of Law, Professor, Head of the Department of Civil Law and Procedure of Uzhhorod National University, presented research “Smart contracts in medicine”; Savchyn M.V., Doctor of Law, Professor, Director, Research Institute of Comparative and International Law, Uzhhorod National University, presented “Influence of bioethics on essence content of human rights: some considerations on the nature of rights of the fourth generation”; Boldizhar S.O., PhD in Law, Senior Lecturer at the Department of Administrative, Financial and Information Law of Uzhhorod National University, had the paper “Legal relations in the sphere of rights protection of a person of the fourth generation”; Hromovchuk M.V., PhD Law, Senior Lecturer at the Department of Constitutional Law and Comparative Jurisprudence of Uzhhorod National University, “Euthanasiaз in the Netherlands: is it the right to worthy death or murder of mercy?”; Zaborovskyi V.V., Doctor of Law, Associate Professor, Professor at the Department of Civil Law and Procedure of Uzhhorod National University and Stoika A.V., Master Student of Law Faculty of «Uzhhorod National University», presented a report “Legal consolidation of “gender neutrality” as one of the elements of rights enjoyment of a person of the fourth generation”; Lohvynenko B.O., Doctor of Law, Associate Professor, Head of the Department of Administrative Law, Procedure and Administrative Activity of Dnipropetrovsk State University of Internal Affairs, had a research “Prospects for the recognition of the right to euthanasia in Ukraine”; Panina Yu.S., Ph in Law, Senior Lecturer at the Department Civil Law and Procedure of Uzhhorod National University, “Legal fundamentals of rights enjoyment of a person of the fourth generation in health care according to the legislation of Ukraine”; Uvarova N.V., Doctor of Law, Deputy Chief of the Department of Information Systems and Information Protection of the Branch of Information Technologies of the Department of Information Analytical Support of the National Police of Ukraine, who presented a research “On the issue of the implementation of the right to change (correct) a gender”; Yavor O.A., Doctor of Law, Senior Lecturer at the Department of Civil Law No 2 of Yaroslav Mudryi National Law University “Protection of personal non-property rights of especially vulnerable social groups of individuals in medical care provision”; Pishta V.I., Postgraduate Student at the Department of Administrative, Financial and Information Law of Law Faculty of Uzhhorod National University, “On the issue of subject matter of transplantation”, as well as other participants who joined the international scientific and practical conference on a very relevant topic and presented equally interesting and important reports. The conference results will be published as a collection of abstracts where participants’ visions of the issue under consideration will be represented. We express our gratitude to all those who expressed interest in participating in the international scientific event and joined the discussion of an important and topical issue.